Traffic signals and direction signs became museum pieces, fragments of a dead language. You might see a 13-year-old boy driving a pick-up at high speed in the wrong lane, or a driver stopping his car in the middle of the road to chat to a friend. Or you might pull over at the sound of an ambulance siren, only to find that someone had rigged one to a donkey cart. Of course, senior officials travelled in convoys at top speed in the wrong direction – and would be followed by a trail of madcap drivers trying to keep open this temporary gap in the congestion. Baghdad has no parking restrictions. You could just pull up your car wherever you like. Something the car bombers used to good effect – you could drive right up to your target and no-one would stop you. Comments Off on Driving in the Cradle of Civilization. Click here to leave a comment. Speaking of traffic lights, apparently there’s a movement afoot to paint them black. 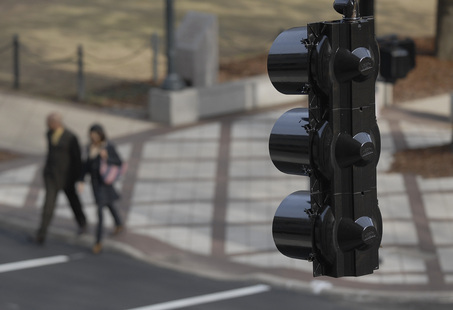 Birmingham Traffic Engineer Greg Dawkins said the black signal heads look better. “I found no compelling reason to keep the yellow, except that is the way it has always been done,” he said. Comments Off on ‘…and I want to paint it black…’. Click here to leave a comment. Comments Off on Self-Organizing Behavior at W. Broadway and Grand. Click here to leave a comment.